A joint investigation by Four Corners, The Age and the Sydney Morning Herald obtained documents showing how Chinese consular officials issued at least eight warnings over 12 months to the Georges River Council over its dealings with Vision China Times, a Chinese-language media organisation. The newspaper has been repeatedly harassed because it publishes information in Mandarin that is critical of the Chinese Communist Party. 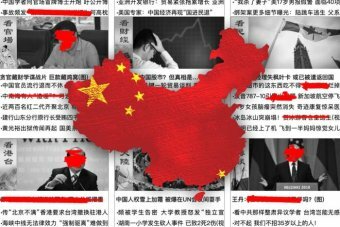 Vision China Times advertisers based in China were threatened by Chinese officials, including intelligence agents, and forced to pull their advertising. The clear case of Chinese interference in Australia comes after the joint Four Corners and The Age/SMH investigation also exposed ties between Communist Party-linked businessmen and senior Australian politicians. Vision China Times manager Maree Ma says her paper has come under attack because it does not toe the Communist Party line. “The Chinese consulate don’t like any media outlets that they cannot have some sort of control over,” she said. She stressed the paper was an Australian owned outlet committed to independent journalism and free speech principles. The newspaper had been listed as a sponsor for the 2018 Chinese New Year celebrations hosted by the Georges River Council. The council area, in Sydney’s south, is home to one of Australia’s largest populations of Chinese-Australians. But on January 17 last year, a consul official wrote to the council warning “we have noticed a politically anti-China media named Vision China Times has been listed as an event supporter”. “We have attached great importance to our cooperation with the Georges River City Council and hope there will be no change to the policy of the Georges River Council on supporting the development of Australia-China relationship,” the consul official said. That same day, Vision China Times had its sponsorship banned by the council. A council administrative officer emailed the Chinese consulate to confirm the move. Are we letting China breach New Zealand’s sovereignty?